Got Cabbage Maggots? Invitation To Brassica Growers To Collaborate In Research | Chatham-Kent Agriculture Development | We Grow For the World! Did you know that a new research project on Cabbage Maggot in vegetable brassicas has just begun? The project pulls together a team to learn about the flies, Delia flies, which cause the pest known as Cabbage Maggot. The project: Will look at which species of Delia flies are causing the damage in the different crops, and will test for pesticide resistance in the Delia flies across Canada. Vegetable brassicas are: broccoli, cabbage, rutabaga, cauliflower, Chinese cabbage, radishes and other vegetables in the cabbage family. Although one fly, Delia radicum, has always been thought to be the pest, it’s possible that different Delia fly species are at work in the different crops. Who’s involved: Growers of vegetable brassicas, agrologists working with growers, and scouting service organizations. Why? We want to collect flies and pupae from as many vegetable brassica fields across Canada as we possibly can. We want every grower to have the opportunity to be involved, and we need help to collect all those flies! Then we can use the flies to identify species and test for pesticide resistance. What are the benefits to growers? The more we learn about the species of flies involved the better we can do at creating IPM strategies for growers. When we are able to collect enough pupae from a particular field, we will test for pesticide resistance and give the results to the grower. Knowing whether the flies in a field are resistant to chlorpyrifos can help growers use the insecticide more effectively and prevent lost time and money spraying to no effect. Why should organic growers be involved, too? Organic growers have a wide diversity of vegetable brassica crops and so have much to offer in our understanding of which species of fly figure in each crop. Evidence also suggests that presence of organic farms in a local region can delay pesticide resistance in that region. Including growers with a range of field practices, such as organic, helps us understand the pest not just at the field scale but at a regional scale. Why should growers be involved even if their current practice provides effective control? Evidence also suggests that the presence of certain cultural practices or IPM strategies in a local region can help to delay pesticide resistance in that region. Including growers with a range of field practices, such as organic or other cultural practices, helps us understand the pest not just at the field scale but at a regional scale. How does it work? The idea is that in every region, the project will have members that can arrange for collection of flies and pupae in the fields. The collected flies get sent to be identified and tested for pesticide resistance at laboratories. At the field several methods may be used. Yellow sticky traps can be placed in the field. Delia flies are attracted to yellow and become stuck on the traps. Sweep nets can also be used to sweep up adult flies. These methods show which fly species are in the field. 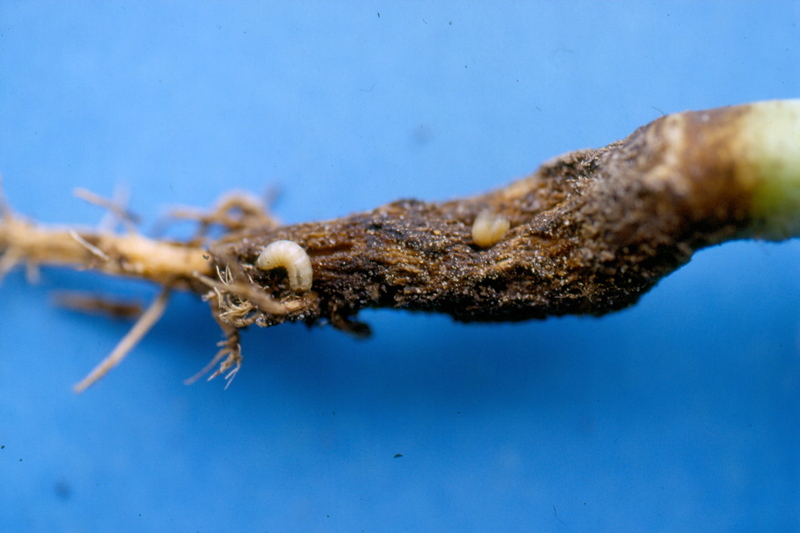 Eggs, maggots and pupae can be collected from the base of the plants themselves. These specimens show more exactly which species in the field are likely damaging plants. If we can collect many pupae from one field, we keep them cool and send them to a lab, where they will be hatched out into adult flies, and then sprayed with chlorpyrifos in a special test to determine whether they are resistant or susceptible. Is there any assistance for cooperators? The project is looking for cooperators who can visit the fields, install the sticky traps, conduct some sweeps and collect the pupae. The project pays for all supplies and materials, and in some cases can assist with student labour or costs of travelling to the field sites. Spread the word: Do you know someone else who might be interested in this project? Please let them know about it! Contact information: We are keen to include you among our cooperators! No matter what region of Canada you’re in, call or write a quick email to Josée Owen, the project lead. She will give you more information about how to be involved, and guide you to a more local contact.